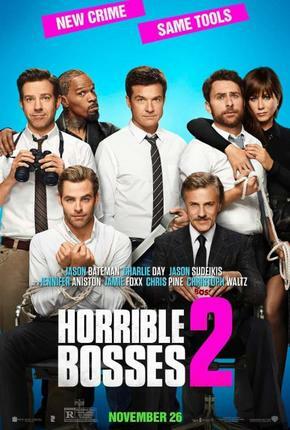 The original “Horrible Bosses” was clever. This one is crude to the point of being cringe-worthy. It keeps the cast, but jettisons most else. Gone are credibility, the exaggerated boss-worker relationships, and any semblance of what a real workplace looks or feels like. In their places are a preposterous plot based on a script with so much use of the “F” word, so detailed a description of male genitalia, and so many contrived situations, that the movie loses all connection to business or to life. And all that really dilutes much of the fun. You will laugh, but not as much as you should — and not at anything you recognize. There are car chases and shootings, prison meetings and kidnap planning sessions, and the longest train you’ve ever seen on film, but it’s all connected by three guys whose situation we don’t believe for an instant. Bateman, Day, and Sudeikis have great comic timing but the dialog keeps forcing them to be vulgar when they could have been clever; Waltz never seems to understand his character; Pine is just arrogant in the most uninteresting way. Spacey’s role is to spew vile and try to make it funny; Foxx just keeps sipping on that straw. And what to say about Jennifer Aniston? In the first film, you could almost see the smirk on her face as she delivered her lines; here, the look is “oh, please don’t make me go there.” She doesn’t believe what she’s saying – and neither do we. And maybe, in the end, that’s the real problem: Everybody in here is just doing what they’re told to do. They like each other and wanted to spend the time together on screen. They had some laughs (see the end credits) and they delivered some laughs. But, if they make a third movie, they should get back to some connection to reality; the business world provides plenty of fodder about horrible bosses and employees trapped in bad situations that audiences can relate to and would love to laugh about. Find them. Bring them. The result could be much more fun than this.